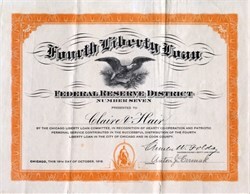 Beautiful Fourth Liberty Loan Service Certificate from the Federal Reserve District Number Seven issued in 1918. This historic document and has an ornate border around it with a vignette of an eagle. This item has been handsigned by the Chairman and is over 97 years old.